Maintaining a beautiful and healthy smile takes some work. Patients should brush their teeth at least twice a day, floss daily, and visit the dentist every six months to keep their smile looking and functioning at its best. However, accidents and dental injuries do occur, even among those patients that take excellent care of their teeth and gums. If you have chipped a tooth, you may feel as though all of the hard work you have put toward maintaining your oral health has been for naught. 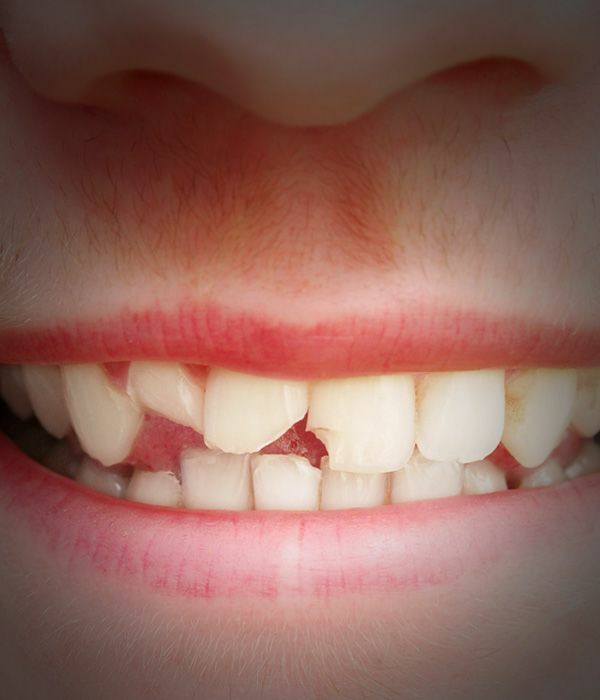 In mere seconds, an accident has resulted in some of your natural tooth structure chipping off. This experience can be quite traumatic for patients, though it is not all that uncommon. The good news is that chipped teeth can be treated. At Harlem Center for Aesthetic Dentistry, we offer restorative and cosmetic dentistry treatment options to restore and even enhance your dental appearance. To undergo effective and natural looking treatment for chipped teeth, contact our New York, NY practice today. Are Your Front or Back Teeth Affected? The type of treatment that you undergo depends of the tooth or teeth that are affected. The anterior teeth are not subject to as much pressure and daily force as the back teeth. For this reason, the front teeth may be treated with cosmetic techniques, including porcelain veneers and dental bonding. Porcelain veneers: Porcelain veneers are generally considered the ideal treatment option because they are longer lasting and more natural looking. Veneers are tooth-shaped prosthetics that are cemented to the front of the teeth to enhance the appearance of the smile. The veneer will be designed and fabricated to the appropriate size and shape, covering the chip and restoring the smile’s appearance. The downsides of veneers are that the treatment requires two treatment appointments and is more expensive than some other alternatives. Dental bonding: Dental bonding is a quick and budget-friendly treatment option. In this procedure, our dentists apply a composite bonding material directly to the tooth. This material is used to fill in lost tooth structure and restore the tooth to its previous appearance. If you have chipped posterior tooth, we may recommend the use of the dental bonding material, or in more serious cases, and onlay or crown. Onlay: An onlay is known as a partial crown. This restoration is made of dental porcelain, and is fabricated in a lab to fit precisely on your tooth. An onlay can replace tooth structure that has chipped off the biting surface of your molars, including the cusps. Dental crowns: Dental crowns are tooth-shaped restorations that completely encase the teeth. They are made of porcelain and crafted in a dental lab. Crowns are recommended when a dental chip has seriously compromised the structure of the tooth. In most cases, crowns are placed on the back teeth. However, if you suffered a large chip on a front tooth, we may recommend the use of a crown in that case, as well. To find out which treatment for chipped teeth is right for you, contact Harlem Center for Aesthetic Dentistry today.